Spanish Playground will be co-hosting Multicultural Children’s Book Day 2016. I am honored to support this celebration of diversity in children’s books. Things are already getting rolling for 2016 with the sign up for the Multicultural Children’s Book Day Classroom Reading Challenge. Teachers, the Multicultural Children’s Book Day team is challenging you to read 4 multicultural books to your class (picture books appeal to all ages!). When you do, you will receive a free multicultural title from us. The Junior Library Guild is sponsoring the MCCBD Classroom Reading Challenge and will donate 200 books for classroom and teachers. The books are pre-screened, library-quality books that map to Common Core. Reading multicultural books is its own reward, but we know that it takes a conscious effort to build classroom collections of diverse, quality books. We want to help! So, when you share multicultural books with kids, we will contribute another book to your class. 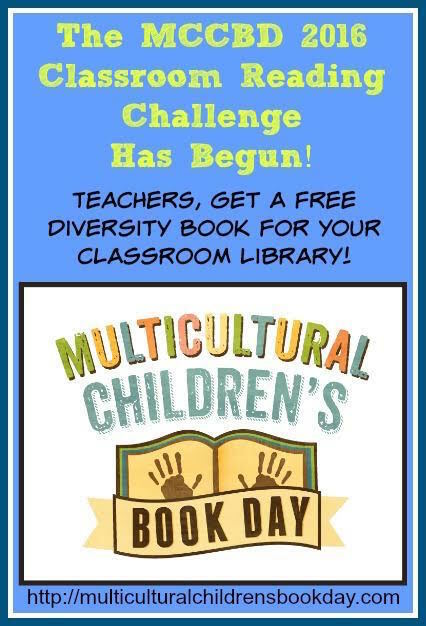 Get all the information and register your class to participate in the MCCBD Classroom Reading Challenge by visiting Multicultural Children’s Book Day website. Celebrate and encourage diversity in children’s books! Thanks so much for mentioning this, Jenny! We are so glad you are a CoHost for MCCBD2016! Jenny we’re so happy you’re a co-host this year !!! Thanks for helping us spread the word about the classroom reading challenge. We’re so excited about this and so happy to be putting high quality books into kids and teachers hands. All thanks to Junior Library Guild !!! !